District 3’s Taylor Wroten gets a solid hit during their 8-4 win over eventual champions Asia-Pacific on Thursday, Aug. 2. The pressure — whether they showed it or not — was certainly there from the opening pitch. As the defending champs — in any sport — the bull’s eye is squarely on you. Such was the case with Delaware District 3 in this year’s 2018 Little League Senior League World Series, held once again at the Pyle Center complex in Roxana. The District 3 squad from Georgetown, led by manager Craig Kormanik, gave it everything they had but came up just short of repeating their magical run of a year ago, finishing third following their Sunday, Aug. 5, win over East (Worcester, Mass. ), 5-1. Wroten went the distance in all seven games of the tournament for District 3, posting a 6-1 record with a 1.06 ERA (0.98 WHIP) that included 50 strikeouts against 11 walks. She allowed 41 hits over her 53 innings in the circle, and of the 11 runs scored on her, only eight were earned. In the third-place game, Ryleigh Elliott was setting the table like no one’s business — as she had done several times in games during the tournament. The centerfielder went 3-for-4, with a run scored. For the tournament, Elliott batted .448, with 13 hits in her 29 at-bats. She would score nine runs while knocking in five others. Also in the third-place game, Kylie Kruger and Hadlie Jarvis each contributed 2-for-3 efforts at the plate, with both scoring a run, and Kruger adding an RBI to her line. Kruger finished her tournament with a .364 batting average that included three runs scored and two RBIs. Jarvis chipped in with a .353 average, two runs scored and six RBIs. Sierra Livingston also had a strong tournament after a slow start. The soon-to-be junior at Sussex Technical High School batted .333, with three doubles, six RBIs and four runs scored. Siera Jones contributed well when her number was called, to the tune of a .500 average on 6-of-12 hitting. She also had two doubles and four runs scored. Catcher Kelsey Kormanik hit .364 with two doubles and an RBI. Jordan DiFava added her .333 average to the cause as well, with three doubles, four runs scored and three RBIs. Delaware 10, Latin America 2: District 3 jumped out to a 1-0 lead after two innings of play, and made it 2-0 after the fourth. However, Latin America responded to tie things up with one swing of the bat in the sixth as Coralys Santiago belted a two-run home run over the fence in center. District 3 brushed that off their collective shoulders, and came out with bats blazing with an 8-run, seventh inning that pulled out the win. Livingston was 3-for-4 in the game with two runs scored and a RBI. Elliott was 2-for-5 with two runs and two RBI. Hadlie Jarvis was 2-for-3 with a run and three RBI. Kayla Evans also had two RBI in the game. Wroten, like she did in every game of the tournament, went the distance allowing the two runs over six hits to go along with her five strikeouts. Delaware 8, Asia-Pacific 4: District 3 again broke out of the gates strong, scoring seven runs in the first two innings — five in the first alone — en route to the Pool A win over their counterparts. The win locked up the top spot in the pool as the locals finished unbeaten at 4-0 in pool play. Elliott, DiFava and Livingston each contributed two-hit nights in the win. Jarvis knocks in three runs, while Livingston plated a pair. Wroten allowed the four runs — three earned — on eight hits, with four strikeouts. Delaware 2, Europe-Africa 0: Wroten fired a two-hit shutout for the locals, to advance them into the semifinals. She allowed six hits, with two strikeouts, and the defense behind her was spotless. DeFava recorded the only multiple-hit effort in the game, with her 2-for-3 performance. Elliott, Wroten, Evans and Layfield had the other hits for District 3. Wroten scored both runs. 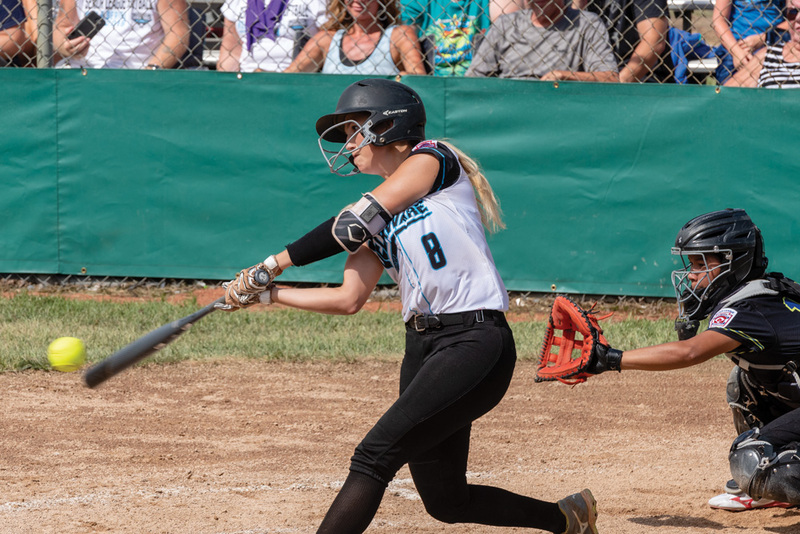 Southwest 2, Delaware 1: The hopes and dreams of a back-to-back championship run came to a halt with this narrow setback to Southwest, which was representing Waco, Texas. District 3 scored its lone run in the top of the third inning, thanks to an RBI-double by DiFava that scored Elliott. Southwest answered with two runs of their own in the bottom half, and it proved to be all that they would need, as Alex Earhart came on in relief to shut out District 3’s offense down the stretch. District 3 had plenty of chances off Earhart but could not come up with the timely hit. Livingston had a pair of doubles in the game but was left stranded in each instance. Kormanik and Jones had the other hits for District 3 in the game. Wroten took her only loss of the tournament, allowing the two runs on five hits, with eight strikeouts. Delaware 5, East 1: District 3 recovered from the previous night’s heartbreaking loss to defeat East in the third-place game. District 3 took advantage of nine hits and three East errors en route to the win. Elliott led the offensive effort with three hits, while Kruger and Jarvis added two-hit performances. Kruger and Kormanik each had doubles in the win as well. Wroten finished the tournament with the complete-game win, allowing eight hits with the one run, while setting down five East batters on strikes. Extra bases — The East team was honored with the umpire’s sportsmanship award after its semifinal loss to Asia-Pacific. Early indications are that District 3 will once again host the Little League Senior League World Series next year — which would be its 16th straight year hosting the tournament in Roxana.